If you have RA............................NEVER STOP MOVING!!!!!! I love love love spin! This workout is a great high cardio and muscle building class. 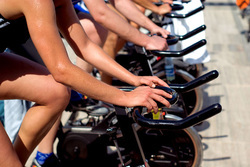 During the average class you will burn anywhere from 400-600 calories and bike 8 to 12 miles. That is great! The other day when I went to give myself my Enbrel shot I notived my thighs have gotten crazy toned. Even my arms are getting toned. This combined with my weight loss has made me very happy. On occasion if I really push it I will have some mild knee pain. There can be definate wrist pain if you lean forward alot and push all your weight on your hands. I try to be sure and ride hands free through most of the workout. This has done two things for me, taken the pressure off my joints, and started to tone my core muscles (even better). So, if you are looking for something different, give spin a try. Low impact, High calorie burner Did I mention the bathing suit? I wish I would have gotten into biking sooner. I now have two bikes. One I use for trail riding and the other is a Vintage Schwinn Tornado, I use to run errands around town. This is the best exercise to me, I always feel like I did a good hard workout afterwards, even when I am just riding around town. I hope this year to step it up a notch and try harder trails or go for more than my average 6 mile ride. I went kayaking for my first time this spring and I am hooked!!! Who knew how fun, relaxing, and excellent of a workout this could be. I spent have been looking everywhere for used kayaks. They are a bit more expensive than my budget will allow, but I am going to try and pick up another shift at work and dedicate that money specifically to a kayak. I am going to ask my Doc how she feels about this for me, I did notice after an hour of paddling my wrists and fingers started to cramp up and I had to take breaks after that. Maybe there are some gloves I can wear or a special paddle? I have much research to do and I will let you know more as I learn. In the mean time, rent a kayak and enjoy a beautiful day on the water!